My next trip was to Singapore. I had a week off, so I decided to backpack around Singapore. There were a lot of places which I visited there. 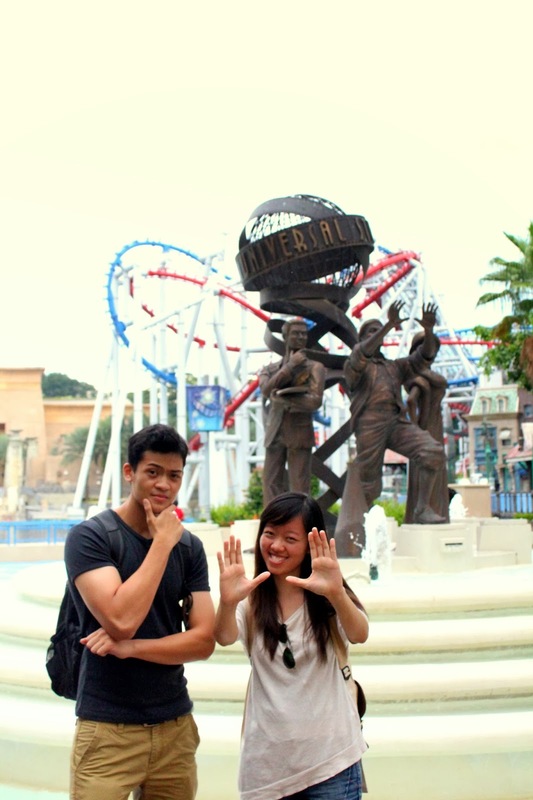 Therefore, I am going to kick it off by blogging about Universal Studios Singapore (USS) first. Opened in 2010, Universal Studios Singapore consists of 24 movie-themed rides, of which 18 which are specially adapted for the park. The park consists of 7 themed zones :- Far Far Away, Madagascar, Hollywood, New York, Sci-Fi City, Ancient Egypt and The Lost World. Each of these zones is based on blockbuster hits, featuring character appearances, shopping and dining areas. 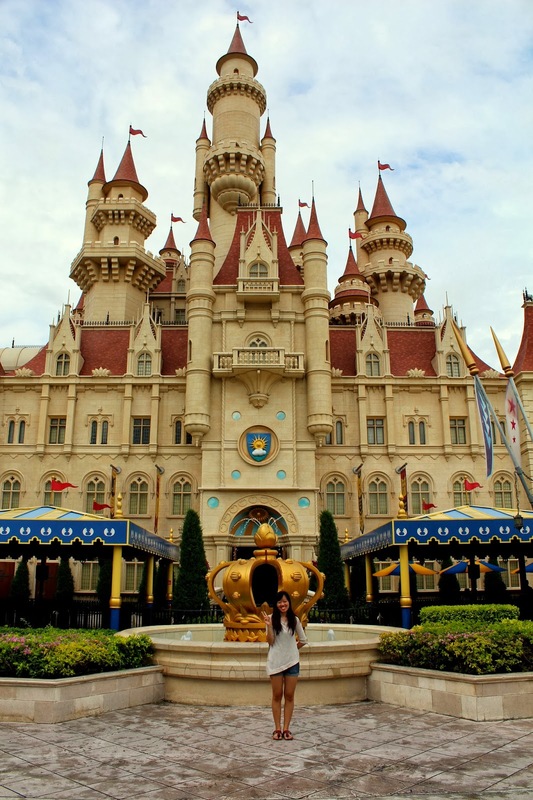 Universal Studios Singapore is easily accessible by public transportation. Just take the MRT to the Harbour Front Station at VivoCity via the North-East line (purple line). Upon arriving there, follow the signboards leading to the Sentosa Express which is at the 3rd floor of VivoCity. Get down on the Waterfront Station - first station of the train. Tickets cost S$4 per pax. You could also walk there from VivoCity which should take around 15 minutes. I got geared up and met up with a friend of mine, Suu at the Harbour Front station. Keep in mind though, the MRT can get really packed in the morning as most people here use public transportation to work. Once we finally arrived at VivoCity, we caught the train and got off the first station. The place was still empty when we arrived there. The USS opens daily from 10am till 7pm. 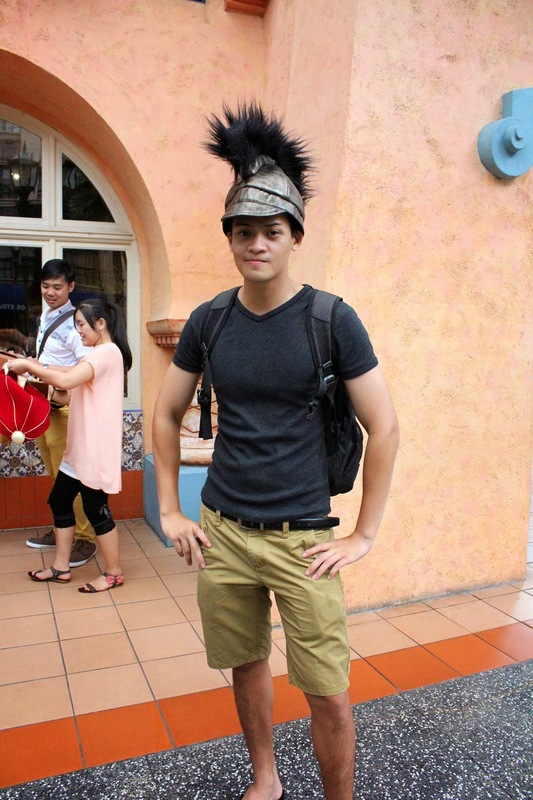 Entrance fees are S$74 for adults, S$54 for children, and S$58 for senior citizens (65 years old and above). We started off with the Hollywood themed zone initially as it is the main entrance of the park. One of its main attractions would be Monster Rock where Universal Classic Monsters would be dancing and singing Rock-N-Roll tunes. Don't miss the chance also, to catch the street entertainment such as, Mel's Dinettes, Daddy O's and the Cruisers. I had a go at Frankenstein ! Moving on, we reached to the New York themed zone which is based on New York City, during the era of post modernisation. Various icons portrayed in movies including neon lights, city skyline and sidewalks can be seen here. The replica of the New York Library can also be seen here. I even managed to catch my childhood idol, Elmo performing together with the rest of the Sesame Street gang there. Lights, Camera, Action! which is hosted by Steven Speilberg is the main attraction in this zone. In this show, the audience is enlightened on how movies are created and the special effects used to make them realistic. Found a Cookie Monster store ! Next, was the Sci-Fi City. Being imagined as a metropolis of the future, Sci-Fi city is home to the world's tallest pair of duelling roller coasters; Battlestar Galactica Cyclon and Human which are based on the hit television series, Battlestar Galactica. Unfortunataly for me, these two rides were closed for maintainance that day. It was pretty dissapointing though, as I really wanted to try the ride. 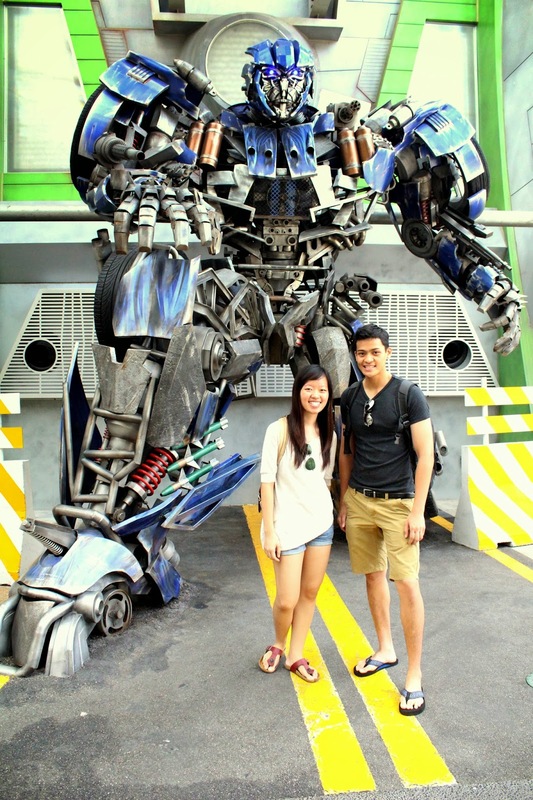 Since it was closed, we then headed to the Transformers ride which is also one of the most popular ride in the park. The ride uses 4-D effects such as hot air, water spray, wind, fog and so on to make the ride more realistic. The wait for the ride was really long. We had to wait for an hour in line just to go for the ride. It was worth the wait though, as the ride was fun and interesting. Sci-Fi city here I come ! Ancient Egypt was where we were headed to next. Based on Ancient Egypt during the 1930s era, the park features pyramids and Pharaoh's tomb which were part of the discovery in the Golden Age of Egyptian Exploration. The main attractions here would be Revenge of The Mummy which is decipted in the blockbuster film, The Mummy. We then walked to The Lost World which is similar to most Universal Studios parks around the world. It is divided into two parts, Jurassic Park and Waterworld. The theme Jurassic Park, is taken from the popular film franchise by Steven Spielberg and features water rides. The Jurassic Park Rapids Adventure got me soaked all over. While waiting in line for the ride, most people can be seen wearing raincoats. I didn't think I would get that wet and didn't see the point of using raincoats as it just takes all the fun away. After the water ride, we then head over to watch the WaterWorld peformance which is also based on a film. The live show performance was held in a stadium whereby death-defying stunts packed with explosions and thrills can be seen here. You are in for a suprise at the end of the show, as it ends with a bang! Just look at how huge it is ! It was late in the afternoon once, we were done with The Lost World. After changing into some dry clothes we went to grab lunch. On our way there, we ran into a parade whereby all the characters from the whole park paraded around the park. It was interesting watching them march and dance their way in front of us. Look what he caught ! We then grabbed Garrett's popcorn, reputabaly the best popcorn in the world. Prices start from S$4 for a plain or buttery popcorn. The bestselling flavors are their signature CaramelCrisp and The Chicago Mix, which is a combination of CaramelCrisp and CheeseCorn. I had a mix of the CheeseCorn and the CaramelCrisp, and after I had my first bite, I was amazed at how the popcorns tasted. These popcorns are unlike any other popcorns, they were more fluffy and they tasted really good. There was a really long queue too, as the customers had to line up till outside the shop. Best popcorn in the world ! Next, we went to Far Far Away, which was inspired by the hit blockbuster, Shrek. Special apperances by, Shrek, Donkey, Puss In Boots and Princess Fiona can be seen here. One of the main highlights here is the 40-metre tall Far Far Away Castle, which is really huge. What a huge castle ! Last but not least was the Madagascar themed zone. It is based on the movie Madagascar which features 4 zoo animals, Alex, Gloria, Marty and Melman whom escape from the Central Park Zoo and ended up in the island of Madagascar. 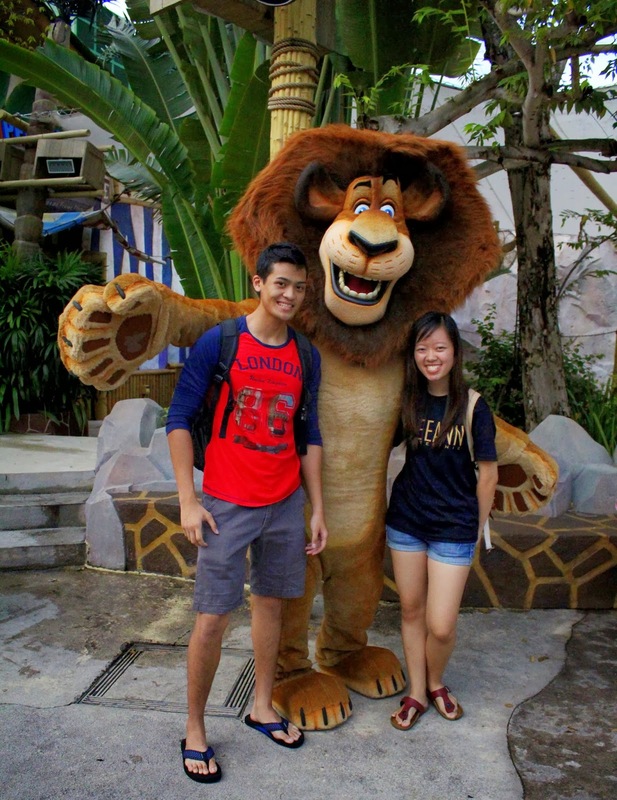 This was one of my favourite zone and it gets even better as I got the opportunity to take a photo with Alex the Lion as he was my favourite character from the movie. To sum it up, I had a really great time here. Enjoyed myself here and I am really looking forward to coming back here soon. I was dead tired at the end of the day, but it was totally worth it. 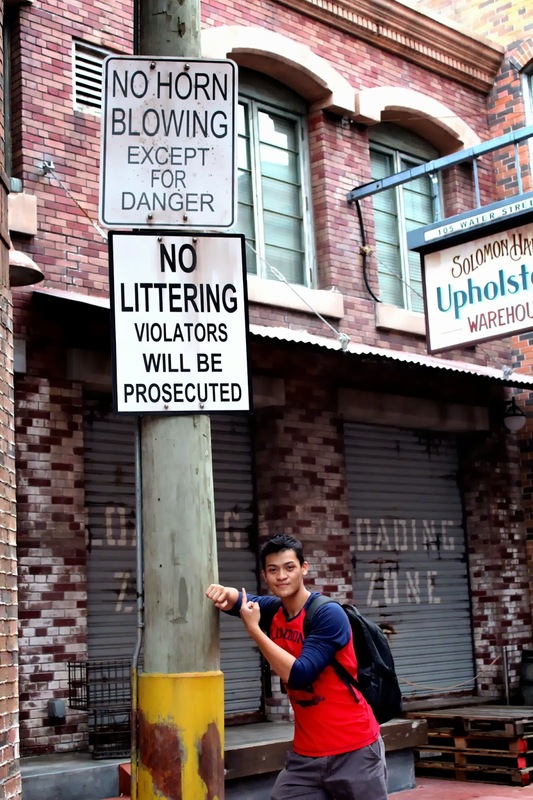 Universal Studios Singapore is a definitely a must-go if you ask me. Fabulous tour of USS , which I didn't have that many attraction . Wow..I must visit USS real soon, many interesting attraction around..I was there some 20years ago!! Good article. Just a question, do you know a website to find the Cheapest Hotels in Singapore? I find it peculiar to search the web without asking other people’s opinion. 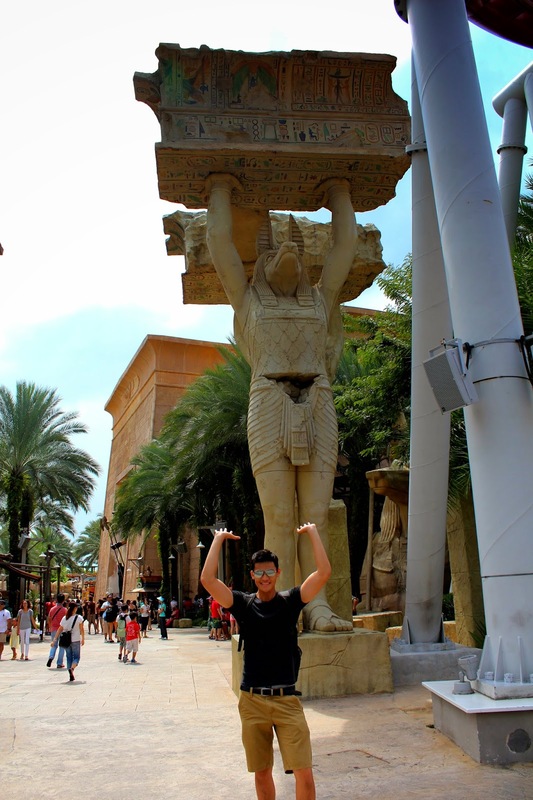 Seems like you have visited all the rides in Universal Studios Singapore as shown in your photos. What is your pick for the most memorable ride in USS? They had a nice journey. They had been spending their time with great memories. travelling from one place to another is always worth spending we can make ourselves fresh free from all the worries. We just do what we want. Hello there, Travel Delight has a special promotion for USS tickets/ packages you may want to visit our site http://traveldelight.biz or email ask@traveldelight.biz for more details. Grab now for a limited time only. Thank you! I hope to visit this place someday. Nice article and beautiful picture! Thanks for sharing. Looks like you had a lot of fun. You might want to try Johor Bahru as well. There are Singapore Legoland transport services you can hire to bring you from Singapore to Johor such as MPVs from JohorTransport.com. Hi, Nice photos! Actually those guys are the Cruisers, not the Daddy-Os. The Daddy O-s have not appeared for quite some time now. Hi J. Thanks for the feedback. Greatly appreciated. Hello Alexander. Nice sharing. Normal price for USS ticket: SGD74 (Adult) & SGD54 (Child) .if interested to get it for friends at promotion price I do sell SGD67 / RM185 for adult & SGD52 / RM143 for child. Alright thanks Jessica. I'll let you know if I have friends going there. Travel at the best part of world I have follow this blog that nice There are many of such high quality new york city boat tour as well as best of trailers available with the service providers. The water boat operates on regular basis from popular tourist destination in the country and the price charged for it is also quite affordable. Make sure you have the best experiences NYC Adventure Tours of travelling through these locations at ease. Hi Alexander! How are you? Just dropping by for some updates. 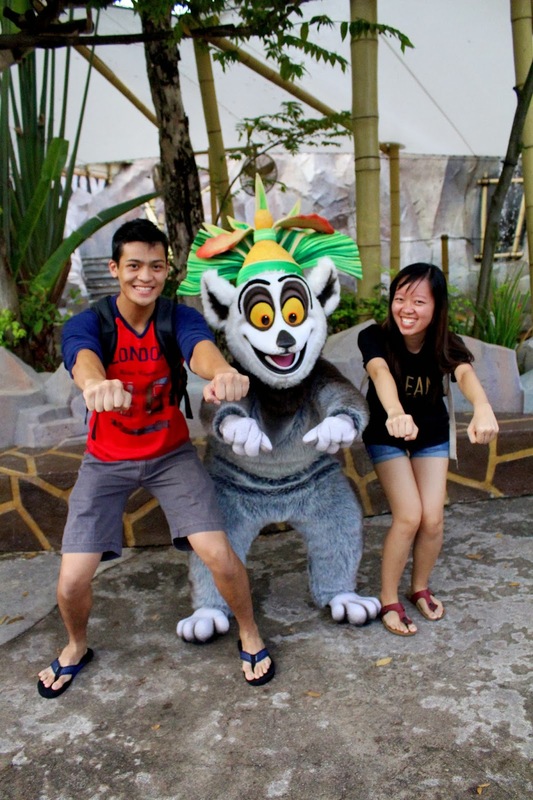 . . Feel free to check-out our latest Singapore tickets promotions such as USS/SINGAPORE ZOO/GARDEN BY THE BAY/SEA AQUARIUM/NIGHT SAFARI/SCIENCE CENTRE &more! Surely lower than counter price & OPEN DATE! Example: USS, MYR 211 per adult (est SGD66 only) USS package with 2 ways transfer via bus from DANGA BAY JB - USS available too. You may request an email of quotation. Do you know if this park will be opened in February? "Mari bergabung dengan kami di GADISPOKER dan di sini kami mempunyai bonus menarik loh..